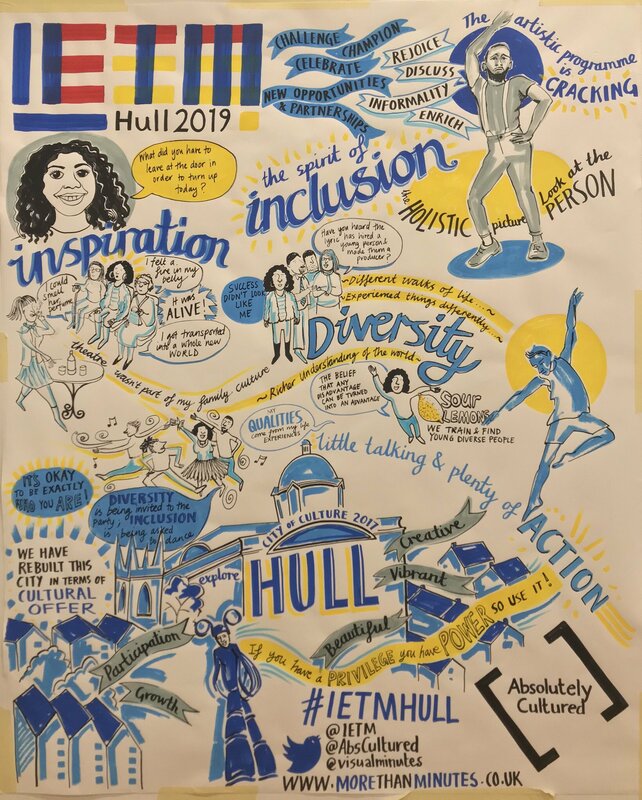 There is something disorientating about being in Hull at an International theatre Meeting (#IETMHull – my first) on the day we should have enacted Brexit, in a City which voted heavily to leave and would almost certainly vote the same again today if given the chance. And to be here on the day Theresa May’s meaningful vote crashed for the third (or is it 2.5th) time. And the very fact I’m here is that my place has been part funded by Start East, a European funded scheme. This is a strange time for you Brits said ITEMs Secretary General Asa Richardsdottir as she threw open the doors to the conference. Strange time or no the sun shone over Hull’s “spires and cranes” , its “ships up streets” and delegates from across the world. Ends Middlechilds Us Against Whatever, which in its striking second half brilliantly captured that underlying feeling of disempowerment. Of finally we are given a voice. In her dynamic opening presentation Sade Brown quoted Verna Myers. ‘Diversity is being invited to the party, inclusion is being invited to dance’. Teja Reba (City of Women, Slovenia) took this idea further asking who is organising the party, and what music are we dancing to. Well in the UK we’d been reminded that 32% of Mps, 51% of doctors, 54% of FTSE 100 CEOs and 70% of judges had come from public schools (7% of the UK population). The echoes of 7:84 are difficult to ignore. Has the referendum invited 35 million to the party, and left them standing on the sidelines? And still Vernas quote challenges nearly each and every session. Jess Thom asked what does a relaxed venue really mean (the changemakers project she has been working with Battersea Arts Centre on sounds fascinating). She urged us to create no new barriers, to ensure equality of experience and, brilliantly, to reduce faff (which is , she argued, what we have been doing around Brexit). Stories – and whose stories are we telling was to become a theme of the weekend. We are all story tellers director John R Wilkinson reminded us. There was talk of taking the stage, of giving people agency – you can be a champion for someone just by showing up for them said Sade Brown. Others talked of todays leaders giving way to new voices (Darren Henley would later list recent changes, then dream of a time when such change would be unremarkable). . ‘Take power, share power, don’t replicate todays power structures’ another delegate said. On the opening night we celebrated the announcement of a whole series of new Unlimited Commissions including Cheryl Martin – One Woman , Byron Vincent – Instagramming The Apocalypse and Tarik Elmoutawakil – Brownton Abbey . 36% of the population (rising to nearly 60% in 18-24 year olds) think going to the theatre is ‘posh’ – a stat which evoked Sade’s story of the first time she attended the Bush, where she nearly left within minutes. We heard (in various sessions) how ‘this isnt for me’ is being tackled through form, through cutting away the faff and through connections and conversations. But there was anger to. Tarik would later chair a lively, passionate and heartfelt session entitled Nothing About Us Without Us. It was a timely debate – especially after the recent National Theatre recent programme announcement (see also this Theatre and the Invisble Women – again, blog by Stella Duffy ) – and one that focused around whose stories are we telling, and who is telling our stories. Robert LePage was hotly debated. Chief Executive of Arts Council Darren Henley (who earlier had announced the UK was very much open for business) reaffirmed ACE’s commitment to diversifying the workforce. A responsibility which is ethical, social and financial. That a few days after a recent report had shown NPO’s (National Portfolio Organisations) were treading water. Matt Fenton argued for structural change, echoing echoing Lyn Gardners comments inn the article above. But outside the auditorium, away from the stage how much can we really influence the world around us? The final session I attended managed to be both bleak and optimistic. Then austerity happened, and that optimism and hope disipated as quickly as it had arrived. Brexit has further divided us. A society retreating into its own divisions and echo chambers. But can art make a difference? Not whilst we are speaking to our own echo chambers, not whilst voices and stories are marginalised, not whilst the norms/neutrality of now remain unchallenged. ‘We can catch each other right ?